Don't forget about awards! Available in Gold, Silver and Bronze - These medals are designed to be pined to the Finishers Lanyard, They recoginize those who have placed in thier respective categories. Runners come to compete and like to be recognized for their hard training. Trophies and medals are typical for overall winners and age group winners usually 3 deep. On a budget- simple generic inexpensive medals or even a home printed certificate is acceptable- just don't skip recognizing overall winners and age group award winners. 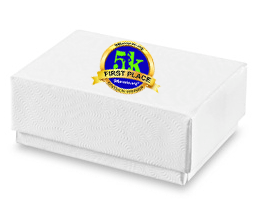 Runners train hard to hone their race times, even a paper award is good recognition for our hard work... but if you really want to WOW the runners, our Recognition Pins fill the bill. Recognition Pins are about the size of a quarter coin. SEE BELOW for suggested categories and number of medals needed for your event. 1st Place male and female medals in each group (Overall winners are excluded from age groups). 1st and 2nd Place male and female medals in each group (Overall winners are excluded from age groups). Marathons and long distance events often use 19 and under as the youngest age group. 1. Five year age groups are preferred by many runners, since those at the older end tend to be similar in fitness level to those at the younger end. 2. Many races will use "70 and over" or "80 and over" as the oldest age group, but having separate age groups will encourage more older runners to run. 3. If you have many children, you can divide the youngest age groups, for example, to 9 & under, 9-14, 15-19. 4. Set the same age groups for male and female runners, even if your race attracts more of one gender. 5. 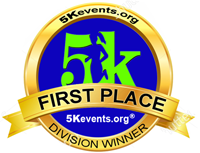 You will give out 1st, 2nd, and 3rd place awards for the male and female winners in each division - a lot of awards. You may have extra awards from age groups with fewer participants. When reporting results, it's important to classify your results by age group. Don't overlap age divisions, and be sure to keep them in consistent intervals. Also available is a gift box (S-11516) measuring 1 3/4 x 1 1/8 x 5/8. Give your awards ceremony a real first class feel.